The application described below is divided into 2 parts: the code required to connect to a Web service and the test cases to verify its functionality. 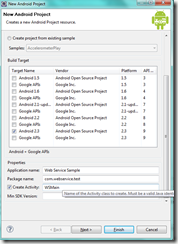 1.2) You can put any name for the project, in my case, I called it webServiceSample. The android version specified is 2.3, but the code should work correctly on earlier versions. In the “Properties” section, you specify the application name, package name and the activity name. These fields were filled out as follows: Web Service Sample, com.webservice.test, WSMain. 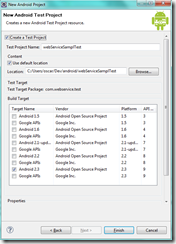 If you want to create an Android test project, click on NEXT, otherwise select FINISH. 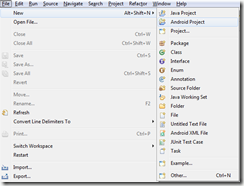 To create a test project, you have to check the “create a Test Project” option and Eclipse will automatically populate all the required fields. 1.6) The Web service call is made through a public function called convertFahrenheitToCelsius which receives as parameter a View object (the reason is explained below). Variable fahrenheit_value stores the degrees Fahrenheit you want to convert. After they are stored, the variable is evaluated to verify it is not empty. This step is not needed, but I have included it to cover this scenario in the test case. 1.7) The next step is to create the SOAP message using the SOAPObject class. This object will hold information like the method name, input value, etc.. NOTE: the envelope.dotNet property is set to “true” because the target Web service is coded in . NET. In this last piece of code, the request to the web service is made; and similarly the response is received. 1.10) At this point we have all the necessary to communicate with the Web service. However, if we run the application it will fail, mainly for 2 reasons: convertFahrenheitToCelsius function is never invoked and the application is not authorized to browse the Internet. The description for the Button component says that the OnClick property must call a PUBLIC function which receive as a parameter a VIEW object. If the correct output is not shown, you can use DDMS perspective to debug the code. The test case name is InputValidation. The super class extends the ActivityInstrumentationTestCase2 class. 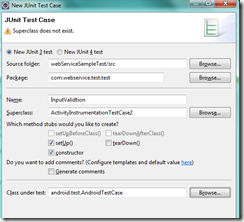 And class that is under test is android.test.AndroidTestCase. 2.3) Next step is to update the setUp and constructor methods. In the constructor, the only thing to do is to call the super class. 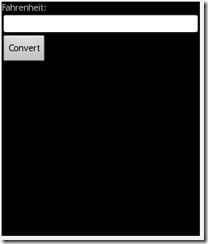 For the setUp method, a reference to the main activity and the TextView objects is defined. 2.6) Last scenario will test the empty string. An empty value is given as input and the application should print the message: “Error!”. This entry was posted on Thursday, November 3rd, 2011 at 8:47 pm	and tagged with android, celcius, fahrenheit, ksoap2, soap, web service and posted in Android. You can follow any responses to this entry through the RSS 2.0 feed.